We have shown, amongst other things, that pre-market measures of IQ substantially statistically explain the association between color and outcomes in the US. This implies that the adult color-outcome differences are substantially caused by IQ differences, rather than vice versa. To investigate this issue further, I have taken a longitudinal approach. As background, it is well established that the year to year correlation for IQ is mediated by general intelligence on the psychometric level and by shared genes and shared environment on the causal levels. The latter two sources contribute to the longitudinal stability of IQ. Unshared environment, on the other hand, does not. This situation is illustrated in the table immediately below. 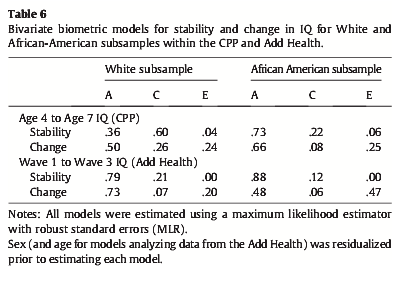 As is shown, the longitudinal stability of IQ scores for both Blacks and Whites is conditioned by genetic and shared environmental effects. For the Add Health sample, in particular, unshared environment contributes only to longitudinal change. It follows then that if differences are due to shared genes and shared environment, as we propose, then the IQ-color association should be largely on a factor common across ages. Moreover, IQ at earlier ages should explain some of the IQ-color correlations at a latter ages. Overall, the association between color and IQ should have longitudinal stability. It is, of course, not necessary that it does. If, for example, labor marker color discrimination was leading to outcome differences which were, in turn, leading to IQ difference, the pre-market and post-market color-IQ correlations would not be mediated by a common factor. Likewise, if idiosyncratic individual factors such as peer group influences were conditioning the differences, one would not expect longitudinally stable color associated IQ differences (since such idiosyncratic influences don’t condition longitudinally stable IQ differences).